Also employed on the P&O service between Northern Ireland and Scotland is the fatscraft EXPRESS. 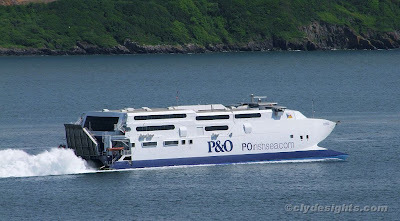 She makes three trips daily from Larne - the first and third go to troon while in between them she makes a return sailing to Cairnryan. EXPRESS makes the crossing in one hour, around half the time that it takes one of the conventional ferries to cross. During the winter months, EXPRESS is laid up at Belfast, and she usually reappears on the service between March and October.